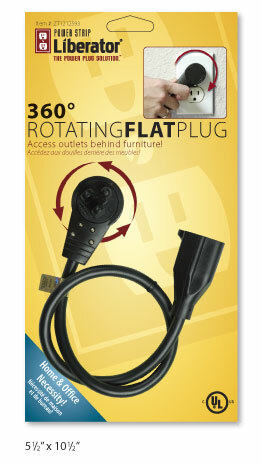 Now you can use the electrical outlets hidden behind desks, couches, bookshelves and more with Power Strip Liberator® 360° Rotating Flat Plug extension cords. The plug extends half an inch (13mm) from the wall, and bends at a 90-degree angle so that it doesn't poke into adjacent objects. The prongs rotate in the plug, so you can aim the cord in any direction.